In 2011 the Prime Ministers office in Singapore sponsored a week of foresight conversations. This year saw the next iteration and I was invited back to the conversation. Once again there were about twenty of us from around the world that were invited, and the diversity of the conversation was only trumped by the quality. My notes are in mind-map form, and therefore I’m going to post some images from the event along with some insights and summation. 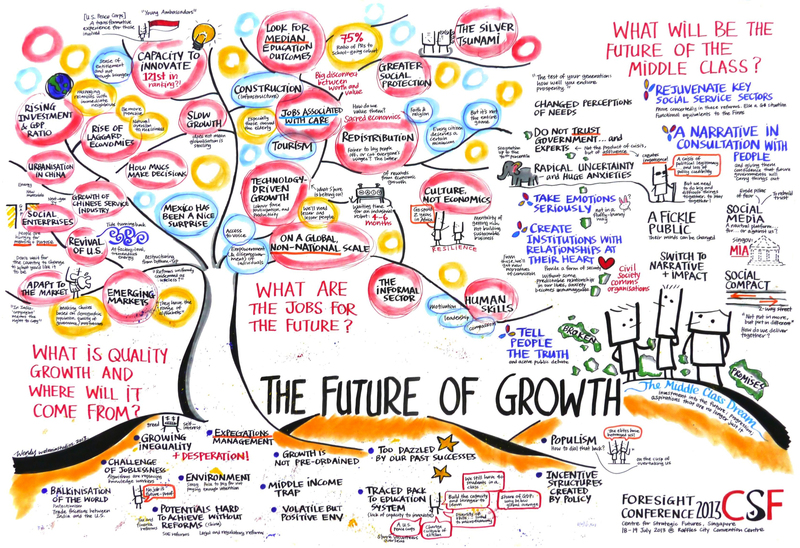 Graphical recording from the fourth day of the week on the future of growth. 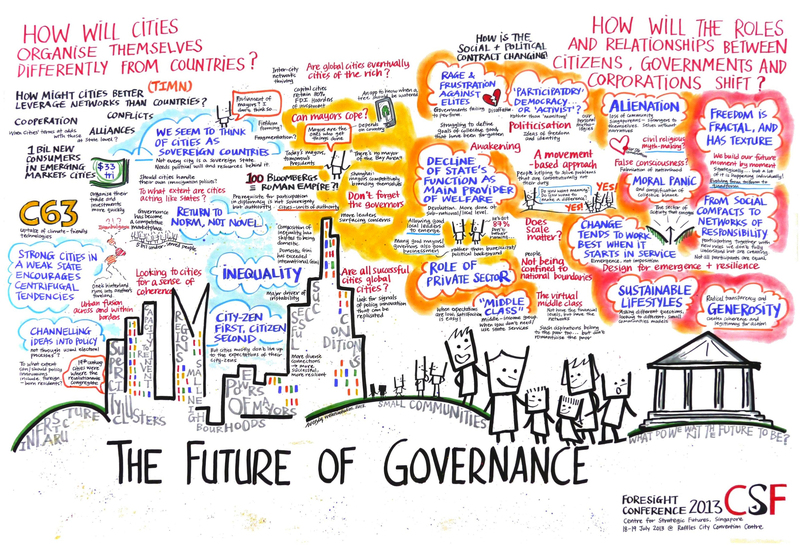 Graphical recording from the fourth day of the week on the future of governance. 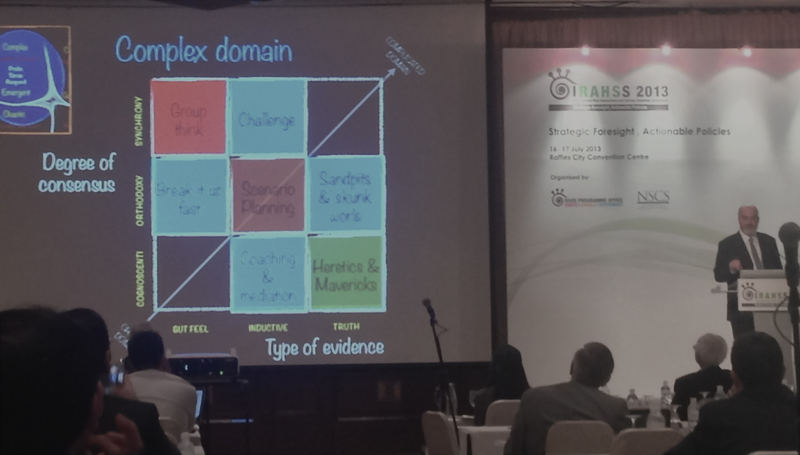 Dave Snowden presenting his framework for foresight and complexity. It’s strategically important to have a good imagination and an adaptable mind. Most decision makers want simple answers, and ask the wrong questions. They want an answer, but in complex environments there may not be a simple answer. there is book called “Future Babble” that looked at previous predictions of the future, and found that the most inaccurate predictions were the ones that were most convinced of their accuracy. The waiting time to purchase a new industrial robot is 4-6 months. 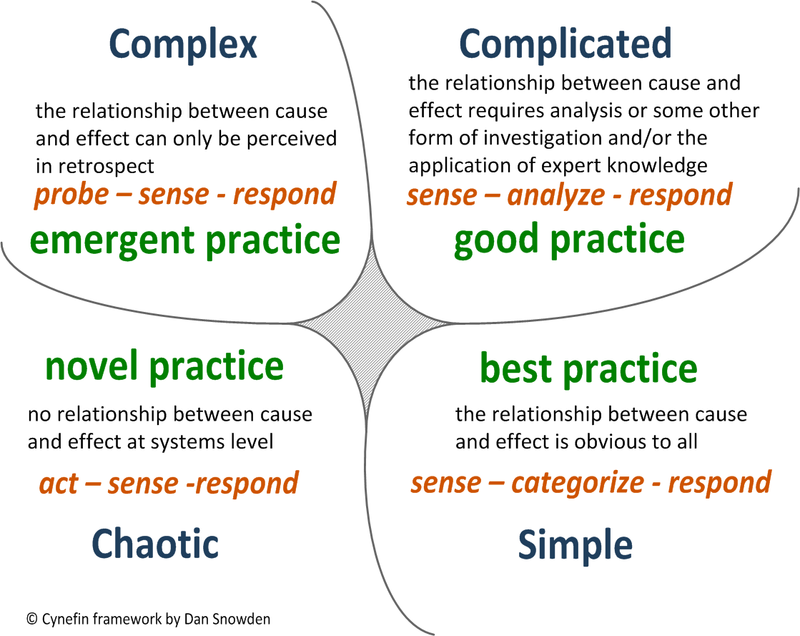 If you find yourself on the left hand side of the framework then you need to understand complexity theory, and acknowledge that there may be no right answer. That’s not easy for decision makers raised to believe that they need to make fast decisions based on minimal information. I’ll close with a wonderful analogy that was provided in a conversation about the work of Karl Popper: you can begin to understand complexity through the lens of clouds vs clocks. You can take apart a clock to understand it, but to understand clouds you need to look at many different variables. Clouds cannot be taken apart.